Daredevil Vol. 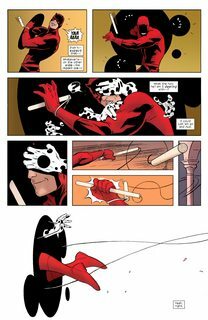 3 #1 – 36 + Annual (2011-2014) : In July 2011, Daredevil relaunched with vol. 3, #1 (Sept. 2011), with writer Mark Waid and penciler Paolo Rivera. Waid said he was interested in “tweaking the adventure-to-depression ratio a bit and letting Matt win again,” as well as emphasizing the character’s powers and perception of the physical world. In the premiere issue, Murdock finds he can no longer serve as a trial lawyer due to past allegations of his being Daredevil causing a case he represents in court to turn into a media circus. Two issues later, Nelson and Murdock have developed a new business strategy of serving as consulting counselors, by teaching clients how to represent themselves in court. Daredevil joins the New Avengers in a story written by former Daredevil series writer Brian Michael Bendis. 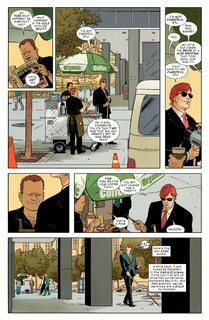 Daredevil appeared as a regular character in the 2010–2013 New Avengers series in issues #16-34 (Nov. 2011 – Jan. 2013). At one point, Foggy begins to question Matt’s sanity, ultimately leading to a fallout between the two. They reconcile once the truth is discovered. Daredevil vol. 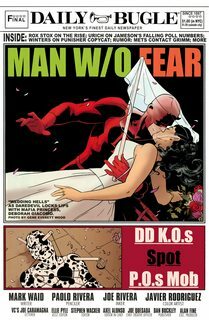 3 ended at issue #36 in February 2014, in which Matt is forced publicly reveal his Daredevil identity, resulting in his being disbarred by New York and prompting him to again relocate to San Francisco.